Julia Kerrigan is an Associate Professor in the Department of Plant and Environmental Sciences at Clemson University in South Carolina. She received a BS in Natural Resources from the University of Michigan, Ann Arbor, M.S. in Plant Pathology from the University of Georgia, Athens under the guidance of Charles Mims, and PhD in Plant Pathology from Washington State University under the guidance of Jack Rogers. She was also a post doc in Jeff Stone’s laboratory at Oregon State University. The underlying theme in her research is elucidating the basic biology of fungi and their interactions with other organisms. She teaches Introductory Mycology and Mycology Practicum (lab) to 80 and 40 students, respectively. Julia initiated a popular mycology course, Fungi and Civilization, which now has approximately 200 students. She has also taught Integrated Forest Pest Management as well as Fungal Ecology and Pathology. She is the co-founder and organizer of a regional mushroom club, the South Carolina Upstate Mycological Society (SCUMS). 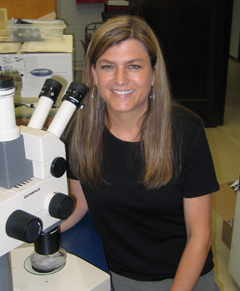 She organized the Mid-Atlantic States Mycology Conference (2011), and served on the APS Mycology Committee (2002-05). Her service to MSA includes: Inoculum Editor (2014-16), Mycologia Associate Editor (2009-11 and 2007-09) and manuscript reviewer, Student Awards Committee member and chair (2012-15) and ad hoc judge (2006, 2008), and annual meeting session moderator (2002). She has been an MSA member since 1993 and looks forward to serving MSA in the future.